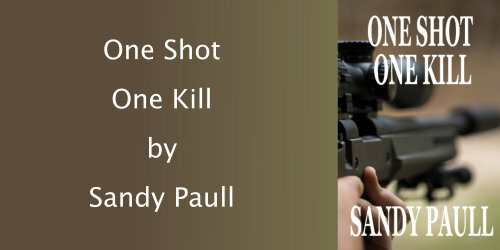 My guest today is author, Sandy Paull. After the release of my first action/suspense novel, Clouds of Grey, in December 2014, several of my readers asked if there was going to be a sequel. They wanted Cassie Hart, my leading lady, who was used to solving crimes on paper, in another adventure, living life on the edge. 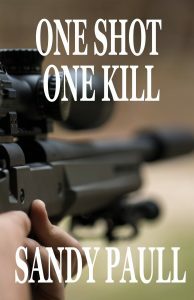 I put my thinking cap on, and after publishing three stand-alone crime/action/suspense stories, I finally released the sequel, One Shot One Kill, in December 2017. For whatever reason, I can’t write a story with only a handful of characters. One Shot One Kill is like a box of liquorice allsorts with so many colourful characters to ponder, so pace yourself turning the pages. I reprised most of the original characters and added a dozen extra. Naming them was a delightful challenge, and I say that with all sincerity. The internet became my friend, guiding me to an endless supply of male and female names. My characters are real to me, and I cannot do them justice swirling my finger around in circles and plonking it down on a page. The names have to have meaning to suit the people I’m creating. Characters are remembered for their looks, their skill, or for their traits, whether they are good or bad. I strive for this when telling a story, and I especially love it when a fellow-bookworm lets me know how much a particular character was hated. To me this means mission accomplished; I have succeeded in getting the right emotional response. Over the years, I have met a few people who have left me trembling in my boots and wondering the depth of corruption they might be involved in. Being an author takes all these recollections to a new level. Fragments of the past become embroiled in an action-packed adventure, ramping up their threatening behaviour to full-on suspense, and using their discerning features to make them memorable. I believe everyone has a story to tell, a fantasy or a true life event in the back of their mind that may potentially inspire a decent movie. The question is, what if you never put pen to paper, or your fingers to a keyboard? No one would ever know what lay stagnant in the recesses of your mind, longing to be shared! Anyone can learn the fundamentals of plotting, structure, and correct punctuation. I didn’t wait until I had all my ducks in a row. I took the plunge and, lo and behold, I bobbed to the surface. We never stop learning from our peers. And guess what…there are also editors and proof-readers who will give excellent feedback along the way to publication. We only have one life to live and we should all be striving to be the best that we can be. For me, writing is my happy place. Without it, I would feel lost and without purpose. How would you feel if you couldn’t express your inner thoughts on paper? Would you think nothing of it? Or would the ember smouldering deep within you flicker a challenging flame you couldn’t ignore? I dare you to dream big and reap the rewards, whatever they may be.